…and I think I know where the knife comes in. Boy, M’s gonna be ticked at Shelly after this is all over. Monica could use her *headlights*, and possibly blind everyone. You still get credit for thinking of it. Those babies would light up the dark side of the moon. Maybe that should have been rectified before they tried this? Am I the only one who feels like this is really rushed? Yes, after all it’s only December 2009. 12/21/2012 is still three years away. Second, for the climatic final batle against the forces of darkness. This does seem to be moving at a brisk pace. If this were an adventure comic strip. They could drag it out for weeks. Well, keep in mind, when the comic first started, there was little to no indication of any ‘calendar machine’. There wasn’t even any hint of the GGG. It was a revelation and plot device that ran its course. For a while, we had Monica’s normal life, then we had the debut of the GGG and their attempts to find a normal life. It was only after the GGG started trying to be ‘normal people’ that the Calendar machine became anything of significance. Prior to that, we all thought Monica’s big ‘significance’ was that she was able to ‘control’ the GGG, a trick she’s only ever used once. Maybe we’ll finally get to start hearing about Amanda, Darin, Jacquline, Owen… I wonder how Owen and Lakshmi are doing? Heck, we don’t even really see Katherine much anymore. I miss them. Am I the only one? Same here. I also miss the times when Tepoz was an important character and Tina was still a mystery. Man, it is always those nagging little details, like knowing how to use your mystical abilities, that gum up the works. I think it’s a case of never getting to the “big boss” without all the stuff they need to fix it. I’m only confused about one thing: what the heck does the tapestry have to do with anything? If it seems rushed, it’s probably just because they’ve finally gotten to the point that they’ve been building up to for years; all the pieces are finally coming together. I know Pablo has more great stuff in mind for us when this is all said and done. How he can top himself is a mystery, but I’m sure it will be good. Yes, and a very scary smile that is, too. Yeah – i don’t think it’s gonna be as simple as it looks. And the demons have gotta be planning something. someone should of been practicing! But she has been — it’s now got a very tight association with her being angry and feeling threatened. Just smile, Monica! That alone will light up the entire room! Well, if she can’t turn on her eyelights. She should turn on her heart light. She just needs a Neil Diamond to activate it. BOOOOOO! Two minutes for punning! I’m just happy that we get to see what has been hinted at for the last four years. Let’s hope M learns how to activate her eye beams…shouldn’t be that hard since she figured out how to POIT pretty easily. So…, You turn your eye lights on, you turn your eye lights out? Aztec Hokey Pokey? That’s what’s it all about? Feeling rushed? As I recall, there’s a host of demons out there with a plan of their own . . . Totally enjoying this, and it seems like they’re all in a hurry to finish, like it’s all coming together and they’re excited about it, well done! I liked the eye/face lights being so essential, we’re so used to seeing the gals use them now it’s interesting how they’re coming into play in the finale. face lights? Eye lights? um .. i didn’t miss anything did I? seriously? 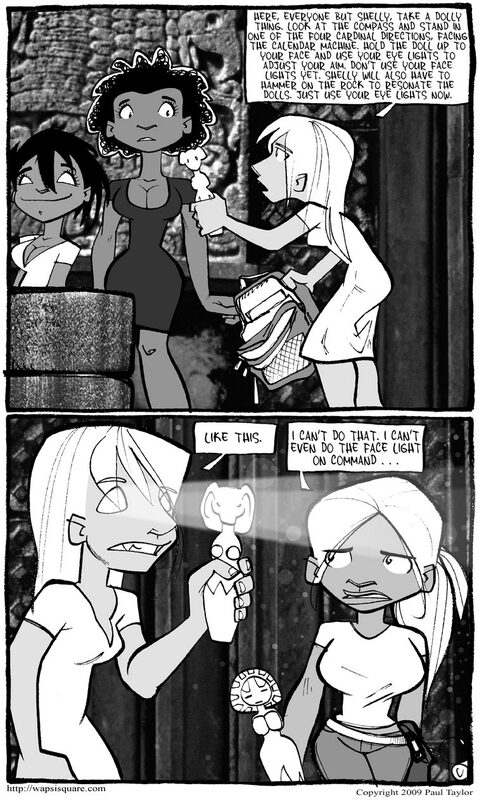 The face lights bit wasn’t introduced that long ago – it’s the glyph pattern that sometimes appears on Monica’s face and on the Gollum girls. For Monica, it supposedly means she’s channeling Jin’s mom. And I assume the eye lights are just the way the GG’s eyes glow when their demonic nature is asserting itself. It’s not really rushed. It’s just that the general pace of the comic up to this point has been glacially slow and a bit unfocused. I’m glad to see it coming to a head now after all this time, and hopefully after this arc is done, we can stop focusing on Monica and see what’s going on with all the neglected characters. Well damn, maybe they’ll get this wrong, but we won’t notice because by the time this comic is done the time loop starts over again and, unannounced to all of us, we have to start from the beginning. Of course, there is plenty of time for them to not get the reset right and get time looped back to square one and they’d have to start over from the beginning again — and stuff could happen differently on the next loop — and as far as that goes, there’s plenty of time for the third time to be the charm. . . .It’d Be cool to have a tee that just said “POIT!” across the “outstanding” part. . .